densho.blog: Book Event: "Japanese American Resettlement through the Lens"
Book Event: "Japanese American Resettlement through the Lens"
When Asian American studies scholars visit Seattle, we sometimes invite them to speak in public programs. This Saturday at the Densho building, we will host a author talk by Lane Ryo Hirabayashi of UCLA. 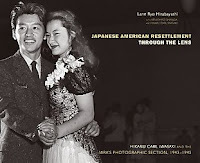 If you're in the area, come hear Dr. Hirabayashi speak about his new book on the War Relocation Authority's use of PR photography: Japanese American Resettlement through the Lens. The book reproduces photographs by a Nisei photographer working for the WRA, complete with the original lengthy captions directed at two audiences: 1) potentially hostile members of outside communities, and 2) incarcerated Japanese Americans reluctant to meet those potentially hostile community members. These staged-looking photos of Nisei happy on college campuses and cozy in new homes feel faintly surreal if you've heard true stories of the poverty and discrimination that released detainees faced. The WRA did not offer to find anyplace. They give you an address and they say, "Well, you go and see if you can rent the place." And they kept calling me because they wanted to take a picture of me so they could send it back to the camp saying what a wonderful place Chicago was and how nice it was to be out and relocated. So I told them the next time they called me, I said, "I'm being thrown out of the apartment, so come and take a picture of that." They never bothered me after that.